• Internationalism. ‘For the international camp of social revolution there is no question of borders; based on the principle of a commonality of interests between the international working class, it rejects all national oppression and does away with national and linguistic conflicts both within the current territories, as well as in relation to the scattered populations of so-called ethnic minorities’. ‘In the period of international social revolution, which destroys the foundations of capitalism’, the proletariat must reject ‘any political slogans based on political forms developed in the capitalist period, such as autonomy, independence, or self-determination’. • A break with the Second International, whose parties in the political field ‘adapted only to a parliamentary struggle for reforms’, and in the economic field ‘to a struggle for a bigger share in the triumphs of domestic capital’. Parties, which with the outbreak of war, ‘grew to ultimately betray the fundamental postulates of socialism, internationalism and the class struggle, and instead stood in solidarity with the bourgeoisie and their governments, and participated directly in the war under the hypocritical slogan of national defence’. • Rejection of intermediate steps in the struggle for socialism. With the outbreak of World War I and the Russian Revolution ‘the era of the direct struggle for the realisation of the socialist system has opened, an era of social revolution’. The party has to ‘exacerbate and deepen the confrontations between the working class and the possessing classes’, make these everyday clashes ‘part of the struggle to abolish capitalism, to establish a socialist economy through the dictatorship of the proletariat’. 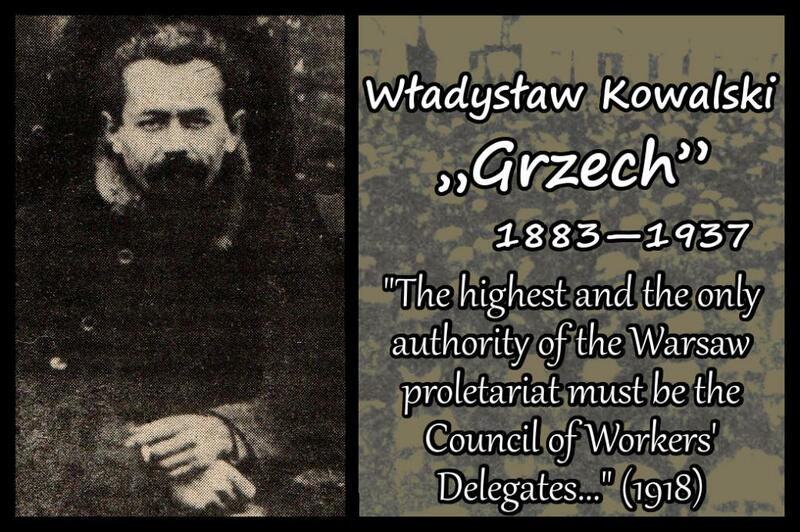 • The dictatorship of the proletariat, which can only be realised when all power passes ‘into the hands of the proletariat of towns and villages, organised in the Councils of Workers' Delegates’. • The need for a cadre party, which will ‘unite the most conscious and most revolutionary sections of the working class within the party organisation in order to give the whole movement momentum and clarity of goals’. • State repression in response to the Polish-Soviet war. Between July and August 1920, about 2 000 members of the KPRP ended up in prisons. In Warsaw alone about 600 communists were arrested. Prison sentences of up to 12 years with hard labour were handed out. In other words, the party lost its original cadres, and in many places even ceased to exist. Due to the ‘white terror’ of the Polish state, the Communists ‘were simply not able to appear on the streets, even to gather in small numbers’ (Warski). • The influx of new members to the KPRP, which to some extent filled the gap following the arrests (in 1921 the party still had fewer members than in 1919). In the years 1920-1921 oppositional leftist groups from the PPS (e.g. PPS Opposition), and activists from Poale Zion and Ferajnigte, joined the KPRP. In the following years also the Kombund, a communist split from the Bund, officially merged with the KPRP. These new members did not abandon all manifestations of reformism or nationalism, and these ideological leftovers eventually began to affect the internal politics of the KPRP. • Stabilisation of the situation both at home and abroad: in Poland – liquidation of the workers’ councils, adoption of the March Constitution, defeat of the Red Army; abroad – the tragedy of the March Action in Saxony, pursuit of coexistence with capitalist powers by Soviet Russia (peace treaties, trade agreements). For some members of the party the lack of immediate prospects for revolution was an excuse to move away from the views expressed in the first political platform of the KPRP. • Pressure from the Comintern and Lenin himself regarding the political and organisational development of the party. In 1921 a Polish translation of ‘Left-Wing Communism: An Infantile Disorder’ was issued, a text which convinced a section of the party leadership to revise its views. In the hands of the centrists of the KPRP (Warski, Wera Kostrzewa, Maximilian Horwitz-Walecki – the so-called 3Ws), and later the party's right wing, the arguments of Lenin became a useful weapon against the Left. • The united front. ‘The Soviet Government wants to exploit all means to support its policies. In this respect, the influence of social-compromise and social-opportunism on the politics of bourgeois government can have great importance. The tactic of the united front, by making contact with social-compromise, allows the use of these influences’. • The peasant question. Slogans like ‘land to the peasants’, meant to kowtow the peasants, undermine the political independence of the proletariat. The effects of this were already visible in Russia, where the peasant has become ‘the real economic dictator’. • The national question. Support for the ‘self-determination of nations' is support for nationalism. A communist party should not only oppose the imperialist urges of the Polish state, but also the nationalist aspirations of Ukrainians, Belarusians, Lithuanians and Jews. • Parliamentarism. ‘In the period of social revolution, and especially since the communist revolution in Russia, the battle for the system of Soviets of Workers' Delegates became the real slogan for proletarian masses all over the world’. A return to parliamentarism, even ‘revolutionary’ parliamentarism, introduces confusion within the ranks of the workers and provides a political space for reformist elements. Wersja polska: Kim byli grzechiści?